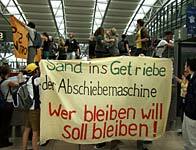 From 15 to 24th August 2008 anti-racists and environmentalists pitched their tents in Hamburg, in a joint camp with shared infrastructure, spaces and time. Both in the camp itself and during actions the attempts were also to stand together and build alliances -- the action high points of the camps included the blockade of the deportation airport Fuhlsbüttel, the occupation of the Moorburg coal power plant and destruction in a foreigners office. Next to this the week offered time for debates, workshops, presentations and practical solidarity as well as multifaceted protest and lived utopia. Here is an overview of some actions that took place during the week -- theres many more reports still to come. Day 1 - Saturday 16th: After weeks of hysterical articles in the corporate Hamburg media about the upcoming 'chaos camps' participants of the camps decided on a warm-up demo : :: photos, :: 2, :: video by Feuerlöscher TV and :: fotos of building the camp. Day 2 -- Sunday 17th: :: Global Pass Fest : with theatre, anti-racist football tournament (:: photos) and an all too rare burst of sun. Added to this was a critical mass. Day 3 - Monday 18th: This was a day challenging everyday racism. Actions included a scavenger hunt through the city, :: Reclaim your market (:: 2, :: photos), :: nuclear waste in Altona (:: photos) and a :: night time critical mass. Day 5 -- Wednesday 20th: Day 5 was a busy one: Actions on land and water :: against the building of the Isilu Dam, and the first occupation of the construction site at Moorburg coal power plant. About 40 people occupied the site, with 5 people climbing a crane with banners. 200 people from the camp also spontaneously decided to join the occupiers, but were stopped one kilometer away by police deplying batons against them Despite this small groups of people made it through police lines to support the occupiers. It then came to two groups of people surrounded by the police, and a spontaneous demonstration. Except the people on the cranes, everyone on the buildng site was taken into police custody and taken away from the area. :: Full report with photos and :: photos from an alternative harbour tour. Action was also happening elsewhere as a group of about 30 masked people in broad daylight smashed up the 'foreigner affairs office' part of the local government office. (this is the government office responisble for deporting people for example). Windows were broken, as well as computers, and a fire extinguisher which had been filled with red painted doused the office walls, technical equipment and furniture. In the airport an unaccompanied suitcase sparked an evacuation due to bombscare: the bombsquad found a note against deportation inside. As well as this an interactive anti-racist tour of the city 'its raining caviar' was :: violently attacked by police. 4 people were without warning brutally arrested, one person beaten unconscious then removed still unconscious out of the ambulance and into a police car. This tour had been addressing subjects such as everyday racism of police and residents of the area, gentrification, police harassment against transsexual streetworkers, and videosurveillance of the Reeperbahn and bordering streets, and was just ending as the police operation arrived in force and attacked.